I am very blessed to live in a "real" neighborhood where I actually know and interact with my neighbors. We email and call each other often. We also hang out together on occasion! 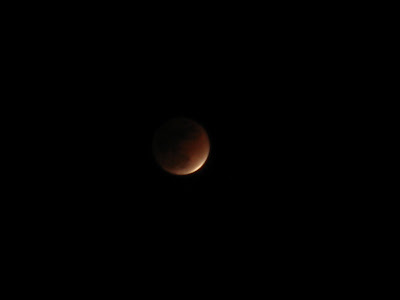 One such occasion happened last week when we had a rare occurrence of a moon eclipse. James, Donna, and their son came to hang out with us in our back yard to watch this spectacular event. While it was rather cloudy for most of the show, we did get a few amazing glimpses of the extraordinary celestial experience! Afterwards we went to the kitchen for some warm oatmeal snack cookies and homemade hot chocolate (my favorite frugal recipe!). Michael asked why I didn't make his favorite chocolate chip cookies, he seems to think those are the only permissible cookies in our house. But these cookies are "grown-up" cookies. 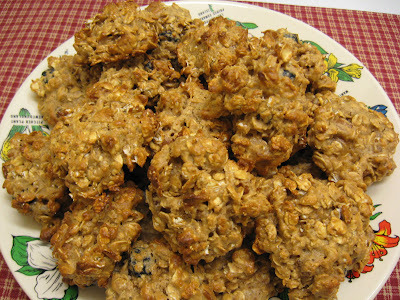 They are warm, nutty, sweet, fruity, and (shhh... don't tell anybody) good for you! Packed with fiber, fruit, healthy fats, and lower in sugar, they are truly a very healthy (and delicious!) cookie! 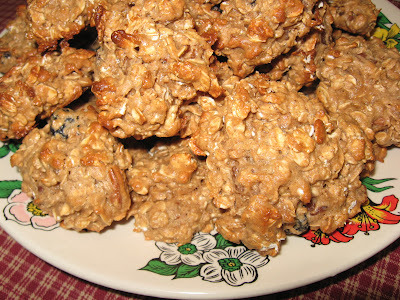 The idea for these cookies came from a recent Southern Living issue. 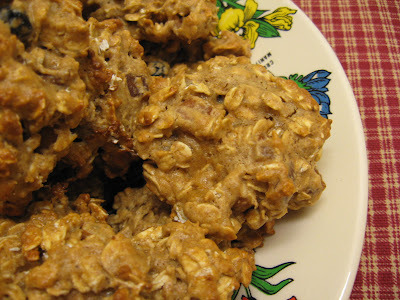 I changed the recipe considerably, not only to make it gluten free, but also very easy. I used my new gluten free master baking mix which worked beautifully in this recipe! I can't wait to make the cookies again. I think next time I'll throw in some chocolate chips for Michael. Poor guy. I'm so thankful for my neighbors! 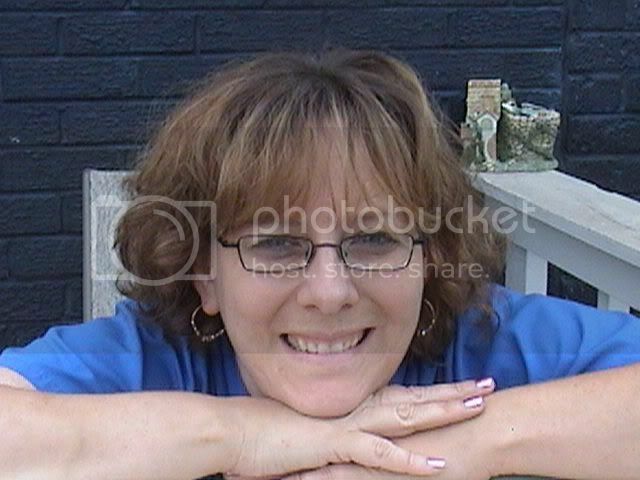 Donna is one of the most positive people I know and she always makes me feel like I am an expert cook and baker. (You're too nice Donna! You always seem to miss my cooking flops.. I'll invite you over next time!) She and her husband enjoyed these cookies (and that yummy hot chocolate)! I hope you will too! Preheat oven to 350 degrees. Combine master mix and pumpkin (or apple) pie spice together. Set aside. Mix neufchatel cheese and brown sugar together at medium speed until fluffy. Add eggs, one at a time until well blended. Add vanilla, mixing until blended. Gradually add flour mixture, beating at low speed until blended. In a large bowl mix oats, dried apples and pecans together. By hand, stir oat mixture into cookie batter just until incorporated. Drop dough by rounded tablespoonfuls onto baking sheets lined with parchment paper. Gently flatten into circles. Bake in batches at 350 degrees for 10-15 minutes until golden brown, or until a toothpick inserted in the middle comes out clean. Makes around 35 cookies. Let cool slightly on wire racks. Cookies are excellent warm and will be chewy! This post is linked to Ricki's Gluten Free Holiday Roundup at Diet, Dessert, and Dogs. Hi Carrie. Your cookies look wonderful! I may give them a try this weekend as we'll be snowed-in again. The beginning of your post made me laugh because we did have a crystal clear view of the eclipse, but we tried to watch it through skylights. We did venture outside eventually and it was far more spectacular when not looking through glass; however it was 12 below zero! Suzanne -- THANK YOU! These cookies are very good! I bought some dried cranberries this week to make some more this weekend! I can't wait to try them again! I don't feel guilty eating these cookies!! Karina -- I ALWAYS appreciate your comments dear girl!!! I am lucky to have such wonderful neighbors. I actually know all of our neighbors by first name and I think that is a true blessing! I'm glad you like the cookie idea! I hope you can make a recipe for them (I know you can't tolerate the dairy or the eggs!) I need to do some Karina friendly recipes! I'm trying your "uncheese sauce" this weekend!! Carrie, I wish it was 12 degrees...that was -12! Snowing now, sigh! Hmmm, I always have dried cranberries on hand, maybe I'll try them with the apple. Suzanne... I know it may sound crazy... but be thankful for the snow! I am one snow loving girl and we haven't had one little drop of it all winter! The grass is always greener isn't it!! ;-) I can't believe it was -12 degrees there! Dang! that is cold! I don't think it's ever gotten that cold here!! What a great post! Your eclipse party sounds lovely- and cookies too, mmm. Those look great with the addition with apples! Wow those look yummy! I do have a serious issue with oats, but did not know that they had certified gluten free oats. I will have to look for those. That is great that you have a close nit neighborhood. I do not have any neigbors and sometimes wish I did. can't wait to try this recipe out, carrie. thanks for posting this as i love these kinds of "grown-up" cookies! These look great! They remind me of some cookies I made off Sara Snow's website. You should check out her recipes, healthy and easy to make gluten free! I love all your recipes and have tried many of them, and have liked everyone so far.